Your subscriptions are automatically tied to the account you are signed in to at the moment of a product activation, and then they are stored in the Parallels cloud. You can view and manage all your subscriptions there at any time, just sign in to your Parallels account at https://my.parallels.com/. After sign in you will see the Dashboard page with your products overview. To view details of an active subscription, click on Active Subscriptions in one of the product boxes. You will see the list of active subscriptions with their renewal or expiration date and the number of licenses it includes. Active - the subscription is now active. All products activated by licenses that belong to this subscription can be used without any limitations. Expired - the subscription has expired. All products activated by licenses that belong to this subscription cannot be used anymore. Grace period - the subscription is in the grace period, which started the next date after the date when the subscription had to renew. Possible reason for the grace period: Your subscription was scheduled for renewal on a specific date, but payment has not been received. You have a grace period of 7 days (starting from the date of unsuccessful renewal) to complete the payment for Parallels Desktop and Parallels Desktop Pro; 30 days for Parallels Desktop Business. 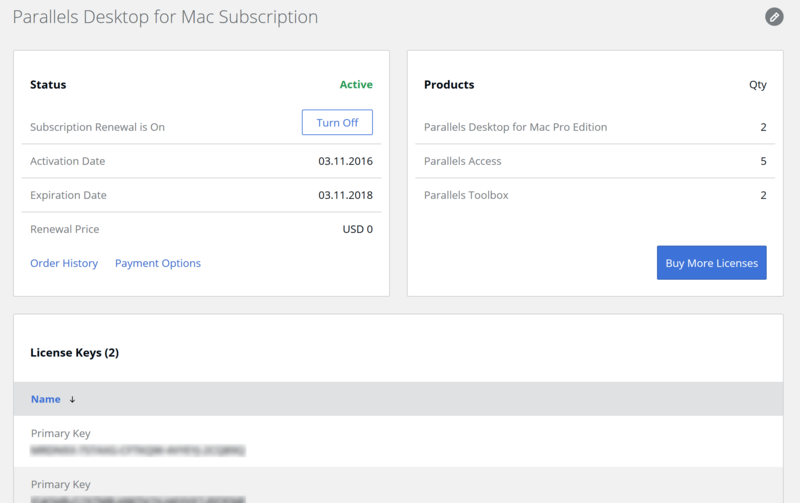 If you don’t complete the payment during this period, all Parallels products and services included into the subscription will no longer function. On – auto-renewal is enabled, the renewal amount will be charged from the assigned payment method on the date indicated under Expiration Date. You can turn the automatic renewal off by clicking Turn Off. Off – this is an automatically renewable subscription, that has auto-renewal canceled. You can turn the automatic renewal on by clicking Turn On. At the date of purchase – for subscriptions purchased at the Parallels Online Store or at the App Store (Parallels Access, Parallels Desktop Lite subscriptions). At the date of the activation/registration – for subscriptions purchased in retail and resellers' online stores. Expiration date – the date when the subscription expires if auto-renewal is off, or is renewed if auto-renewal is on. Order history – your online orders at the Parallels Online Store. Payment options – here you can view and change the payment method for the subscription renewal. Products – additional products included into the subscription and their quantity. License Keys – activation keys that should be used for Parallels product activation.